Boston’s Newbury Street is quiet and leafy; high-end stores peek out between sidewalk cafes, where stoppers sit outside, soaking up the sun. But from down the street lumbers an army utility vehicle, painted tarp-blue and piloted by a man in sunglasses and a tattered red bandana. He goes by the name Captain WeirdBeard. He lets out a strange sound: Quack! His 32 passengers join in. They all wave as they trundle by the shoppers. The Boston Duck Tours are truly unabashedly bizarre. But they’re also far from an uncommon sight. Rain or shine, the 28 boats in the fleet take to the city’s streets and waterways, each captained by a character who tosses back equal shares of personality and Boston history to all aboard. The tours wend their way past the usual landmarks: the Hancock Tower, the Make Way for Ducklings sculptures, the Boston Public Library. But on the swanky Newbury Street, “getting folks there to quack and wave back is the main goal,” one captain told The Gainesville Sun in 1995. For such a tongue-in-cheek institution, duck boat tours have a surprisingly somber origin: World War II. In 1942, the U.S. military was faced with a quandary: with the war ongoing, soldiers stationed overseas were in need of supplies and reinforcements. But by that point, most of Europe’s harbors were in tatters; the military couldn’t get close enough to land to reach the troops. 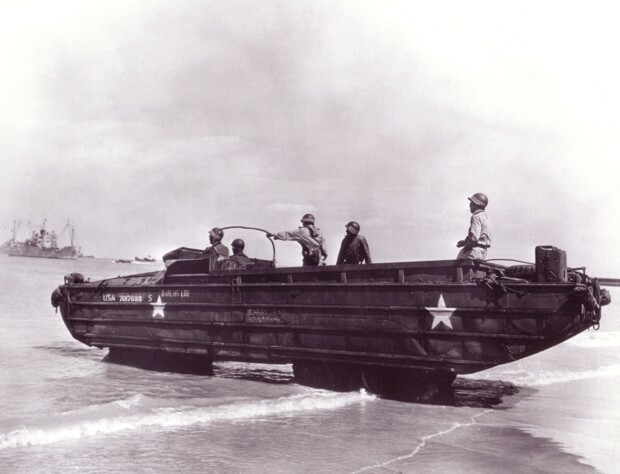 In response, General Motors developed the DUKW—a military-grade vehicle able to operate on both land and water, whose finest moment would come about during the D-Day invasion of Normandy in 1944.The name DUKW derived from military equipment coding: D stood for the year of production (1942); U denoted its amphibious quality; K indicated front-wheel drive capability; W rear-wheel drive. 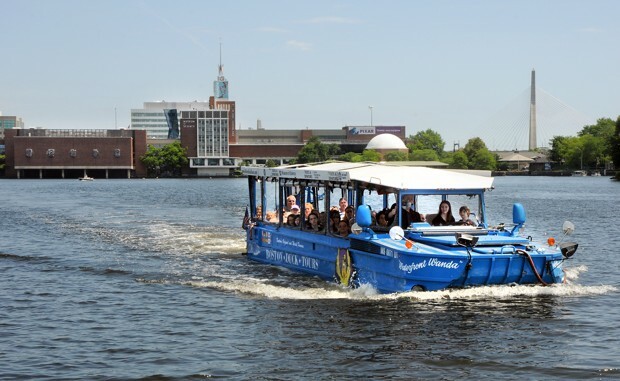 Unsurprisingly, they just became known as “ducks.”These days, Boston is one of several cities that operate such tours. But they got their start in rural Wisconsin. After the war ended in 1945, the military made surplus supplies available for public purchase. Bob Unger, a veteran from Milwaukee, snapped up a DUKW, which he had learned to pilot during the war. Where he saw an army relic, his fried Mel Flath saw a business opportunity. Flath convinced Unger to bring his DUKW to the Wisconsin Dells—the scenic landscape surrounding the southern portion of the Wisconsin River. They launched their first tour as the Wisconsin Ducks in the summer of 1946, says Dan Gavinski, now the general manager of company. By the next season, the tour company operated 37 DUKWs. Today, the Wisconsin Ducks, Gavinski says, has the largest fleet of DUKWs in the country, and their 91 vehicles still date from the Second World War. The move to an urban setting was not exactly smooth sailing. According to the company, bringing DUKWs to Boston “took nearly two years, ‘100 halls of government,’ and fierce determination by an ex-banker [the founder Andy Wilson] who felt that there was more to life than the standard 9-5, corporate world.” Securing the 30 municipal permits necessary to operate the tours was a veritable nightmare “due to the infamous bureaucratic red tape, but also because most people had never heard of Ducks and simply thought the idea of a land/water tour in Boston was crazy.”The tours turned out to not be so crazy after all; during peak season, they now ferry around 4,500 passengers per day. But they are, Brown says, decidedly quirky. The drivers are encouraged to cultivate distinctive personalities, often so effectively that Brown says she sometimes finds herself calling them by their aliases around the office.